For most of the building period, HR53s were fitted with a Volvo-Penta TAMD41-B engine, which weighs in at approximately 455 kg and produces a reasonable 145 HP. The last HR53 units to be built were fitted with a much more modern VP D3-110 engine. The TAMD engine is essentially a 6 cylinder 3.59 litre Volvo turbo diesel bus or truck engine which has been "marinised". The engine is fitted with a hydraulic marine gearbox which is water cooled, as is the turbo charger. The whole cooling circuit is long and complex. Especially if the boat has not been used for some time, it's a good idea to check the water strainer, where sometimes we need to add water to overcome airlocks which may have developed over longer periods of non-use! We systematically check that there's water coming out of the exhaust, having - by omission - burned one impeller in our beginning days of owning the boat! On the one hand, the engine does have a turbo (a hi-tech feature, I would argue), yet on the other, there is a total absence of electronics (which in my view classifies her as very lo-tech). The black box with electrics on the engine (see photo - top left-hand part of the engine) mainly houses a relay to stop the engine (there is no mechanical decompression as on the smaller VP engines I've owned). Like many older Volvo Pentas, our engine smokes. In fact, it smokes quite heavily if load is suddenly applied. This can be quite embarrassing when manoeuvring around in marinas, when you leave black deposits in the water... Yet compression tests on our engine show that she is OK. New injectors were installed just before we took ownership of the boat in 2016 and the valves are regularly and properly adjusted. Nevertheless, James Bond would be jealous of us when we suddenly open up the throttle and produce great wafts of black smoke to escape from pursuing foes. Oil consumption, however, remains moderate and is well within the tolerances for a 20-plus-year-old engine of this size and technology. Perhaps modern bio-diesel fuels also add to the smoking issue on these older engines that were designed for and relied on "greasier" fuels... Officially, the motor had done less than 1000 engine hours when we acquired the boat in 2016. With our sailing, we quite consistently average about 250-350 engine hours a year (both in European half-season sailing as in full-time live-aboard cruising). We suspect significant and enthusiastic under-reporting from the previous owner as the engine control panel had a new rev & hour counter. It's more probable that in reality she had done double that number before we got her... However, as these engines are supposed to last at least some 10,000 hours, there's still lots of life left in her! 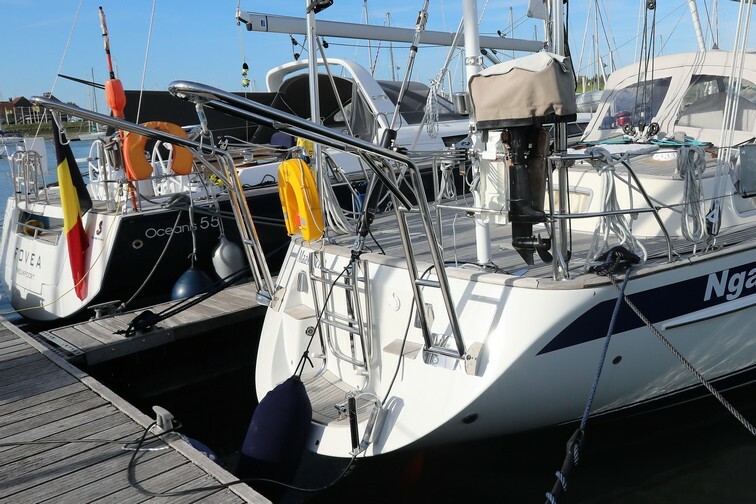 Our local Volvo-Penta technicians (formerly Kant Marine in Nieuwpoort) gave her a clean bill of health after working several days on an extensive revision in June 2016, as has Van Swaay Yacht Service in Bruinisse who did another extended service on her for the winter 2018/19 lay-up. Working with this complex engine has been a new learning curve, as the "beast" is certainly a lot bigger and more intricate than anything we've had before. Because of the way we run the engine for instance (see below, our reasons for running with low revs), there is probably more coke build-up in the exhaust system than in most other engines. So we need to clean the exhaust elbow more regularly than other owners who run their engines at much higher revs would need to. We've certainly learned how to check on the cooling system, as we've experienced a frustrating "fail" here a day out of Curaçao. But generally speaking, our Volvo-Penta, despite these provisos, is a reliable piece of kit, albeit on the noisy side, compared to modern marine engines. It always starts when you turn the key, which is my own main requirement. Furthermore, it can take a fair amount of punishment and still continue to work afterwards. And during our extensive cruising, there've been occasions when we had the engine running for 2-3 days at a time, which it does this without any problems! One advantage of the Flexofold design is that the folding mechanism seems better protected against sea life encrusting itself in the Batsystem gearing of the folding blades. This is a definite advantage in warmer tropical waters, where sea life develops with gay abandon after only a few days. We have managed to pick up a 5m piece of fishnet ( we were motoring off the Galician coast) so we are not totally immune to accidents at sea, unfortunately! 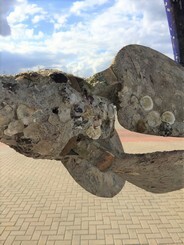 As the photo shows, our propeller looked a sad sight when the boat was lifted after 15 months in tropical (yes that strange brown lump is indeed our propeller!!) waters. The Flexofold mechanism may be immune to crustacean sea life, but the rest of the propeller certainly was not. 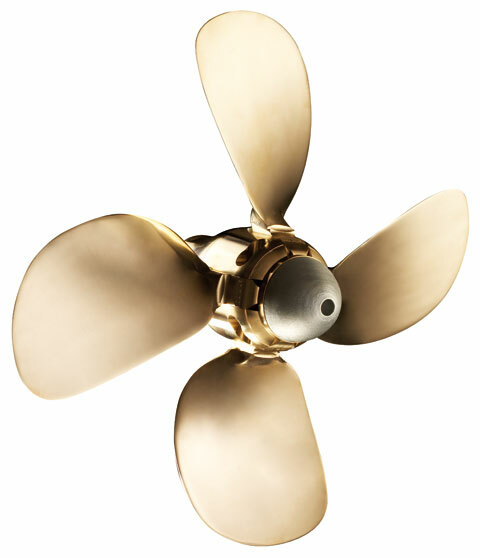 Nevertheless, the propeller continued to propel the boat as it should, with only a limited reduction in efficiency. When testing the boat just before she came out of the water in September 2018, Van Swaay Yachtservice put on full power and we discovered that the PSS propeller-shaft seal actually leaked quite badly. Not that we'd ever noticed this as it didn't leak at the low power settings we tend to use. So the whole seal was replaced over the winter and a spare rubber housing of the seal kept as spare for our circumnavigation. The HR system of having foot-buttons at the steering pedestal to operate the Sleipner Sidepower 10HP bowthruster is very convenient and allows for extremely simple berthing. The 10HP motor (rewired in 2015) also has a better, modern propeller, with little cavitation in the thruster tunnel which is very deep under the waterline. It is therefore very quiet compared for instance to our former HR43! The bowthruster is relatively effective at shifting the bow around. It is only in 15kt+ side-winds that a bigger motor would be useful! 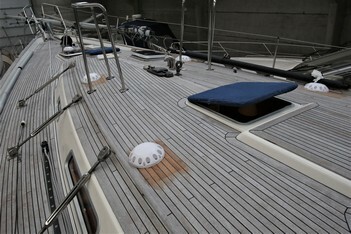 As the larger part of the house battery bank is situated next to the mast, the cable run to the bowthruster is relatively short. With no significant voltage drops, the bowthruster is, as just stated, quite effective (after all, it is only 10HP on an approx. 28 ton fully-laden vessel, compared to the 8HP thruster we had on our 15 ton fully-laden HR43). All stays are rod rigging and all shrouds are st/st 1x19 wires of varying thicknesses - the two running back stays are Liros lines with 4:1 purchase Seldén blocks. The central hydraulic pump for the mainsail and genoa is a Lewmar Commander 20 unit, which Hallberg-Rassy installed in the forward heads. During the 2018-19 winter refit, we added a filter in the hydraulic return lines, which doubles the lifespan of the hydraulic oil in the system. If one looks closely at pictures of our cockpit, attentive readers will spot not the usual 4 winches, but 7 winches, ranging from the standard huge and electric ST66s to a small manual ST40! 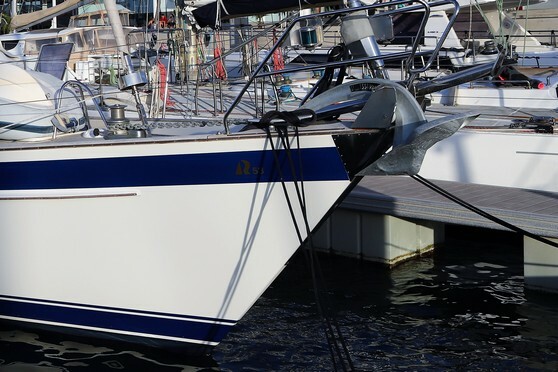 The previous owner went to town to add two intermediate-sized mechanical Lewmar ST58 winches as well as a small Lewmar ST40 mechanical winch to service the mainsheet track. Although it is useful to have dedicated winches in all shapes and sizes for every conceivable sheet or line around the cockpit, this means that getting in and out of the cockpit requires lots of extra thought and dexterity because all usable walking space has been taken up by these extra winches! However, we did find that for downwind sailing, the extra 3 winches offered power for the boombrake, the fore guy and the preventer and were a very useful addition made by Dr Bierhoff. When setting off again in 2019, we'll probably leave, as just said, the gennaker at home; this will create more space and easier access to the other sails in the fore cabin. 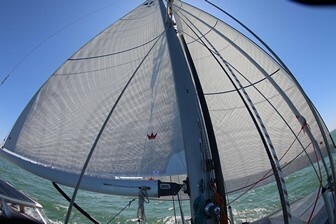 There's not much point in having lots of sails on board if you don't have easy access to them when you need them. Also we would have great difficulty bending some of them on even if we did have access to them, given our limitation in strength. During the winter refit of 2018-19, the whole bow fitting has been removed from the boat so that Van Swaay Yacht Service could beef it up and enhance its solidity. As we found in Guadeloupe when the whole fitting was destroyed, the HR bow-fitting is fine until exceptional forces are exerted on it; then it can quickly buckle and "open up" as pictured below. Our anchor and chain weigh approx. 300kg and to drop this and raise it again, we rely on an old and trusted Lofrans Ocean windlass rated at 1500 watts. When we had it serviced in Guadeloupe in January 2018, the maintenance technician asked whether it had ever been serviced since 1995. Of course we had no answer to that question; I guess that anchoring wasn't a priority for the previous two owners... During our winter 2018/19 lay-up, I checked that the above-deck parts of the windlass also worked fine! For heavy weather situations and just before embarking on the ARC and our circumnavigation we ordered from Ocean Safety in Southampton a parasail anchor as recommended in the Pardeys' Storm tactics handbook (and apparently "unrecommended" by the US Coastguard). Even though it is not our intention to be sailing in waters where big storms would habitually form, it is nevertheless essential to be prepared for everything (see for more details on our Preparing for the ARC page). Maintaining a beautiful teak deck remains as much a mystery to me today as 27 years ago when I took possession of my first HR. With time, though, I have certainly learned what NOT to do. The decks on Ngahue (I) were initially washed and scrubbed with Starbrite teak cleaner and brightener, and the odd dose of teak oil, which looked lovely when applied and then turned dirty and patchy afterwards. When I sold the boat after 12 years, the surveyor strongly advised against this treatment and told me that I had been killing the wood with it, and pointed to one bad spot in the deck that needed expensive attention. On Ngahue II and Ngahue III the decks were given the (strongly) suggested Boracol treatment and very little else, except the odd soft scrub with natural green soap containing linseed oil. Confusingly, instructions for using Boracol vary depending on who you talk to. They range from 'apply a thick coat with a brush once a season', to 'vaporise a thin & diluted coat several times a season'. The first approach seems to yield a more lasting result. Sailing in the tropics seems to have affected our decks relatively positively, as they look a lot "whiter" under the Caribbean sun than before... However, I do seem to be spending a lot more time replacing the dowels after each long(er) seapassage!!! Inside the boat, we have installed 5 Caframo ventilator fans: 3 in the saloon and 2 in the aft cabin plus an extra Hella fan in the engine room - it gets very hot there in the tropics. These operate at three speeds, the lowest of which is pretty much inaudible. Speeds 2 & 3 progressively make more noise, but do shift more air-mass. As Ngahue IV is essentially a 24V boat, our units are all 24V - a pity in a way, as we had a couple of extra Hella fans still from Ngahue III - but those operate at 12V and so are no good to us any more… Usually, these large Rassies have air-conditioning on board, with up to 3 units cooling the aft cabin, the saloon and the forepeak. Such big airco units require a lot of energy (which is why you have a big generator on board, the Yard would say...). From what I read, you need either a very, very large battery bank, or a generator running to keep the air-conditioning going (or shorepower in the Caribbean). We're interested in none of these, and have therefore opted for the "poor man's airco": open windows with the Caframo ventilators to circulate whatever (cool) air comes into the boat. Experience in the Caribbean (up to 30°C with lots of humidity) is that this solution is pretty much OK actually... It only becomes really hot inside in 30°C+ and the sun beating on the boat all day long... But then, we went long-term sailing to escape the cold weather in Europe, no??? At BOOT-2017 in Düsseldorf, we looked at and decided to order a set of Swedish Batsystem davits to be mounted on the stern of Ngahue IV. Most of the bigger Rassies have big and solid Lewmar (or Simpson Lawrence or Whittal) davits, mounted on special supports. These are indeed beautiful and impressive pieces of kit, often being electrically operated as well, and capable of lifting hundreds of kilos as a time. 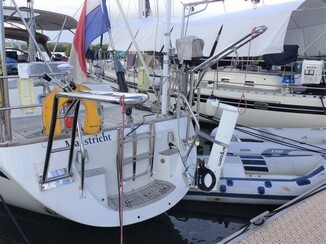 We had a set of Whittal davits on our HR43. And we saw several HR53s equipped with electric davits whilst searching for Ngahue IV. But these davits do require you to reinforce the transom and to cut into the capping rail - this is what the Yard in Sweden, or Nova Yachting in Bruinisse do when they install them with special support blocks. The main disadvantage, though, is that you place an enormous amount of weight at the very end of the boat as the davits on their own are already very heavy. Perhaps with the more modern Rassy designs, and their much longer waterlines (more boat in the water towards the stern), you can afford to have a lot of weight hanging over the stern without inducing any rocking-horse effects. With the more elegant HR53 shape, and her nice overhangs, it seems to me that you would be contributing towards such tendencies. The Batsystem davits simply rest on their hinges that you bolt firmly to the transom and that's it. 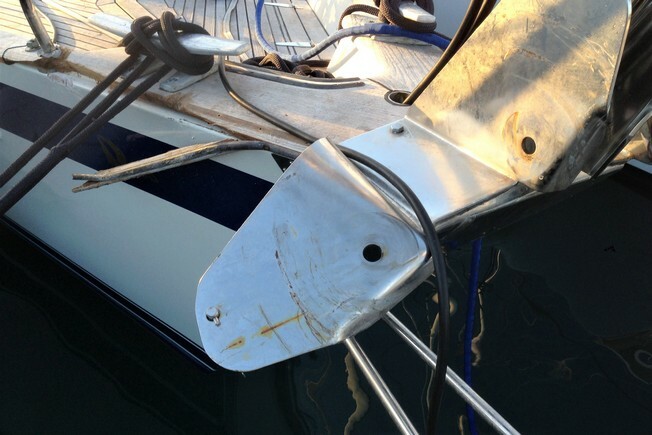 Two tackles and blocks which are attached to the davits at one end and to the pushpit at the other allow you to gently lift up the dinghy in the davits - it's a simple lever movement. It's marvelous simplicity! There is one aspect to take into account though, namely that Hallberg-Rassy makes its pushpits fairly lightly. This is important, because the Batsystem davits use the aft balcony to hoist the davits into the upright position, we knew that we would need to strengthen and rigidify ours. When Maricom installed our communication electronics, and notably the Iridium aerial on a Scanstrut pole on the aft deck (see elsewhere on this page) they proposed to make up two struts to stabilise and rigidify the pushpit. If you look closely at the left picture or our boat, you will see the Batsystem davits and the two struts that were bolted to the aft balcony so that it has become significantly more stable. When we picked up an unmarked and submerged lobster pot in Guadeloupe and needed to launch the dinghy in slightly choppy waters to cut the line, the rocking movement of the boat put the dinghy in the water at the low end of the swinging movement, and then back up in the air the next moment. This jerking movement put so much stress on the aft balcony that despite the Maricom reinforcements the port and starboard balconies twisted out of shape. So we asked for additional struts to be made up and hold the pushpit in place from the other side (see picture on the right). Guadeloupe being French, we learned that these struts are called "bras de force" in French; a rather apt name. The result is that our balconies have become indeed VERY RIGID now. Let's hope that they are rigid enough for all our future needs. But concluding, I don't personally think that Hallberg-Rassies are ideally suited for Batsystem davits, as these rely too much on a strong aft balcony, which isn't necessarily an HR strong point (the Yard provides lots of other positive things though, so this weak point comes as a bit of a surprise; but perhaps other brands are even worse...). 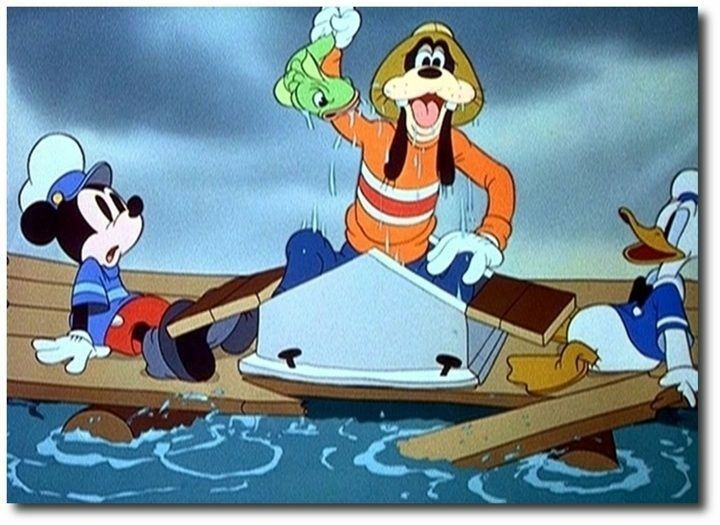 We have investigated the possibility of upgrading to a set of heavy duty Lawrence Simpson davits, despite the fact that they spoil the aesthetic looks of the boat and are quite costly... As the right-hand picture also shows, the back of our boat looks like a dog's dinner anyway!! Perhaps we will make the jump in 2019 and install a set of Simpson Lawrence series 8 davits... With the "high" model, we believe the davits, even with our dinghy in them, won't interfere with the Watt & Sea water generator that you need to drop into the water at the back of the boat... That's another disadvantage we discovered with the Batsystem davits and our "retroussé" stern: it is VERY difficult to slither between the dinghy and the stern to get to the bathing platform... Then again, after some discussion with the Batsystem people at the 2019 BOOT Düsseldorf show, we can probably tweak our davits and continue with them.